Meet Annabelle at Homeward Pet. Photo courtesy of Homeward Pet. 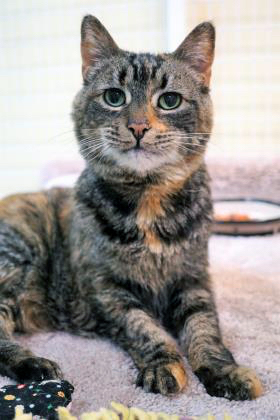 With input from our friends at Homeward Pet we are featuring a cat that needs a loving home. Please be aware that our pets of the week may be adopted at any time, and the shelter does not always let us know when this happens. You know those personalities that just brighten up the lives of everyone around them? How they can make everyone smile and feel so happy? Anabelle is one of those personalities. Anabelle has a heart of gold, a sweet and gentle soul, and an affectionate nature about her. All that Anabelle wants is love. She would be so incredibly content to curl up in your lap for hours. She'll be a wonderful book reading buddy and fantastic movie watching companion. Anabelle has done a lot in her 13 years and is now ready for a life full of relaxation. She lived with cats before and did well, but hasn't met dogs. If you've got a snuggly lap and cozy sofas, then you've found your match! Come meet this darling today. Homeward Pet is located at 13132 NE 177th Place in Woodinville and is open for visitors between 12:00 pm and 6:00 pm, Wednesday through Sunday. Not ready to adopt? You can help our mission by donating items on our Amazon Wishlist.